1. Runner interference. The runner has to avoid contact with the fielder. The runner does not have the right away to the base line. If he makes contact with a fielder trying to make a play the runner is out and all other base runners need to go back to their bases. 2. 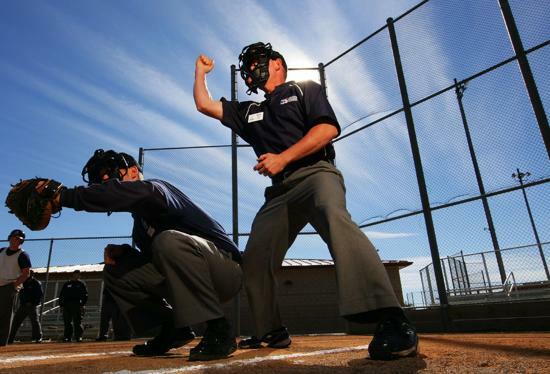 If a base runner touches or passes the base runner in front of them the back base runner is called out. The play is dead and all other runners must go back to their base. 3. Home plate is in fair territory. If the ball hits the plate and goes fair it's a fair ball. 4. Don't call a ball foul until it's foul. It needs to cross 1st or 3rd base in foul territory or be touched in foul territory to be ruled foul. Please see the attached video below to see that anything can happen. 5. Announce all starting times in pool play to both coaches after the first pitch. Get confirmation from the dugouts that they agree. Also announce to the coaches when the game hits 1 hour and 30 minutes. 6. All games are a coin flip. It doesn't matter if it's in the championship round or pool play. Pool play seeds don't determine home team. Thanks guys for the great job. Always remember that Greg or an association member is just a phone call away if needed. The Registration "Umpire Zone" is not currently available.